What does this Best Quote tells us? 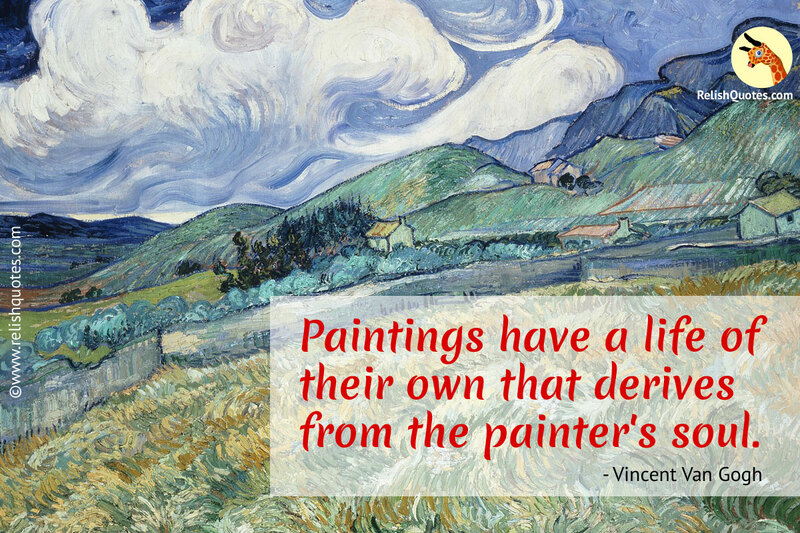 This is a beautiful, Inspirational and Best Quote by Vincent Van Gogh that inspires all of us to have a mind of our own. The beauty and the most amazing highlight of the human brain is power of imagination that God has gifted us with. Imagination is a certain space of the human psyche that entails endless amount of ideas, thoughts, expressions, feelings and emotions. It is the painter’s soul, that works as the birthplace and womb of the creativity for the painting he intends to make. That zone of the painter’s conscience is where all the ideas enter the procedure of processing, where there are no boundaries, no limitations. The Painter’s soul is where images, conceptions and perceptions are drawn with the brush of creativity. A handful of genuinely blessed people in the world are painters, who explore their imaginary space and have limitless thoughts that overflow in the mind, craving to become a painting. The strokes of the painter work like medium through which he expresses his ideas. The thought processing of a painter is out of this world, in the most literal sense of the term. Any painter’s soul is best portrayed in the spectrum of his canvas. The soul of the painter is best depicted on the canvas of the painting that he creates. It is the soul of the painter that completely forms the rough draft of the exact work he intends to paint on the canvas in front of him. There is an absolute sense of clarity that the painting deserves when it comes to life on the canvas. The life of the painting is entirely handcrafted and customized in the hands of the painter and it is he who decided fate of every stroke, every color and every kind of detailing that the painting shall entail. It is the painter’s soul who is the master of the painting and the painting eventually reflects the state of the painter’s soul.